CFS Review 3 The membership fee is fifty cents and will entitle the member to a beautiful membership card, a generous supply from two to four kinds of two-color booster stickers, and CFS Review as well as all official CFS incidental literature. The Review will be published monthly on the odd two weeks that The Denventioneer* is not issued (providing the latter is a success). 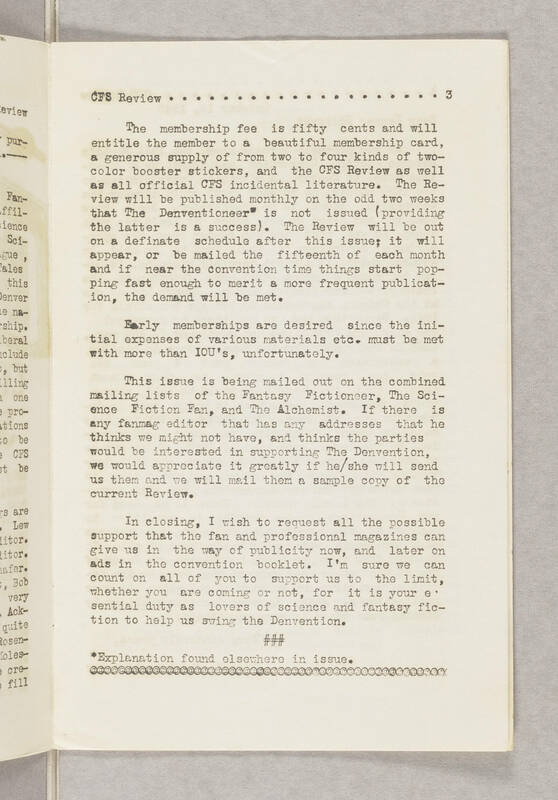 The Review will be out on a definite schedule after this issue; it will appear, or be mailed the fifteenth of each month and if near the convention time things start popping fast enough to merit a more frequent publication, the demand will be met. Early memberships are desired since the initial expenses of various materials etc. must be met with more than IOU's, unfortunately. This issue is being mailed out on the combined mailing lists of the Fantasy Fictioneer, The Science Fiction Fan, and The Alchemist. If there is any fanmag editor that has any addresses that he thinks we might not have, and thinks the parties would be interested in supporting The Denvention, we would appreciate it greatly if he/she will send us them and we will mail them a sample copy of the current Review. In closing, I wish to request all the possible support that the fan and professional magazines can give us in the way of publicity now, and later on ads in the convention booklet. I'm sure we can count on all of you to support us to the limit whether you are coming or not, for it is your essential duty as lovers of science and fantasy fiction to help us swing the Denvention. * Explanation found elsewhere in the issue.